Once upon a time, Doctor Who was a science fiction show. Oh, it was never a dryly accurate thesis on the mechanics of time travel, but nowadays (and particularly around Christmas), Doctor Who becomes little more than fairytale magic. 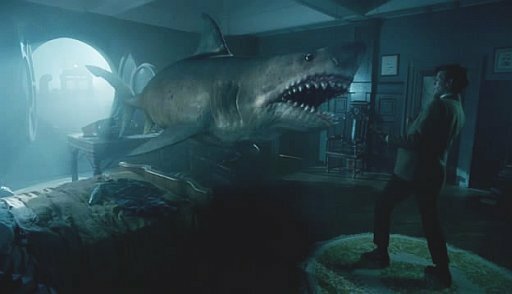 With A Christmas Carol, any semblance of scientific plausibility went out of the window the moment a flying shark came in through it. I recall enjoying this episode when it was first shown, and even thinking it was the best Christmas special they’d yet done. Well, it’s certainly the most Christmassy, but it hasn’t held up very well on a second viewing. In fact, I was distinctly bored for much of the second half. 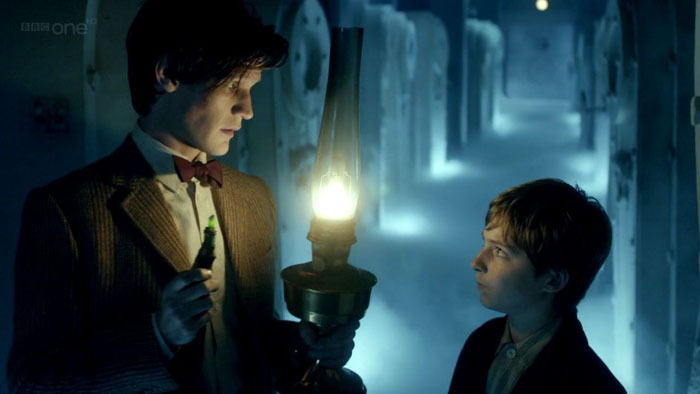 Around the time when the Doctor visits Scroo-… er… Kazran as a boy, the plot loses any sense of urgency and lumbers along for twenty minutes or so, while the young lad develops a relationship with Abigail, the least-developed character ever, who does little more than come out of a box every so often and sing to some fish. Young Kazran takes the Doctor to the freezer vault. On the plus side, the story is occasionally rather clever and, frankly, makes me wonder why it took five years before A Christmas Carol was adapted for Doctor Who. The moment when the Doctor appears in the video that Kazran made as a boy is sheer genius, as is later using his present (old) self as the boy’s “Christmas future”. Michael Gambon is naturally rather good as Kazran (and his bearded father), and a pleasure to watch even though the character is thinly-written. The love story doesn’t have much substance but it’s nevertheless heartwarming. One last day together because Abigail has a meticulously punctual terminal illness that doesn’t manifest itself physically in any way whatsoever. The Doctor’s plan is as contrived as the situation itself, but his goal is as noble as ever and he shows how he can see the good in everybody, even seemingly ‘evil’ people. But, my goodness, he doesn’t half ramble on, blurting out technobabble, talking to himself and spewing out as many words per minute as somebody hearing pips on a payphone. I’ve never really had a problem with Matt Smith before but he starts to grate here. 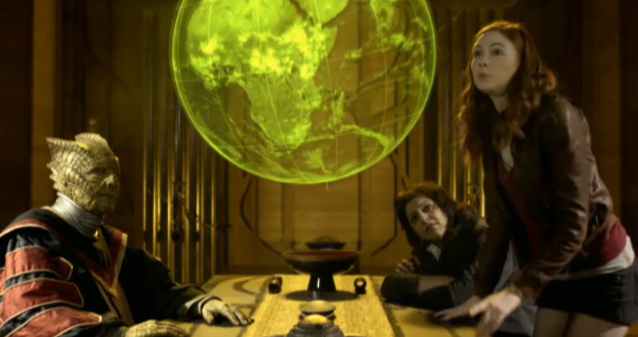 Gillan and Darvill, meanwhile, are practically guest stars for all the screen time they get. The visual design of the episode is excellent. A little bit Dickensian London, a little bit steampunk. This may be a retelling of Dickens classic, but it doesn’t have half as good pacing or structure. I was probably more forgiving of its shortcomings at Christmas, but it’s far too early for that right now. Bah, humbug! Epic finales have capped the past four and a bit seasons, so it was no surprise that season 5 went all out. 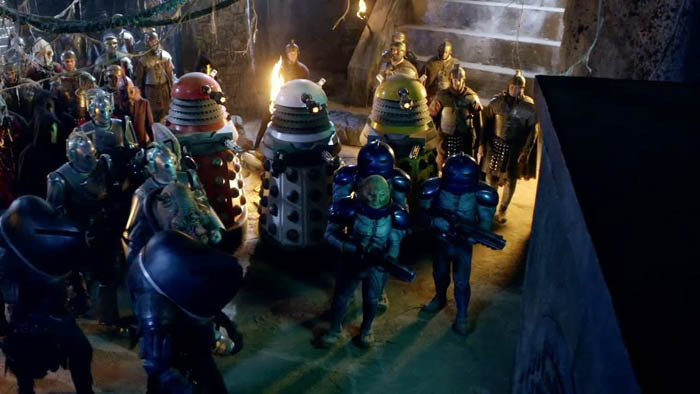 In a scene reminiscent of what Russell T Davies probably intended in The Stolen Earth, every single available alien, robot and creature from the past five years gathers together at Stonehenge 102 AD (including, bizarrely, the Silurians, who shouldn’t even be awake at this point) to trap the Doctor in a giant box, thus stopping him from destroying the Universe when his Tardis explodes in the future. The Universe’s largest recorded INTERVENTION meeting. 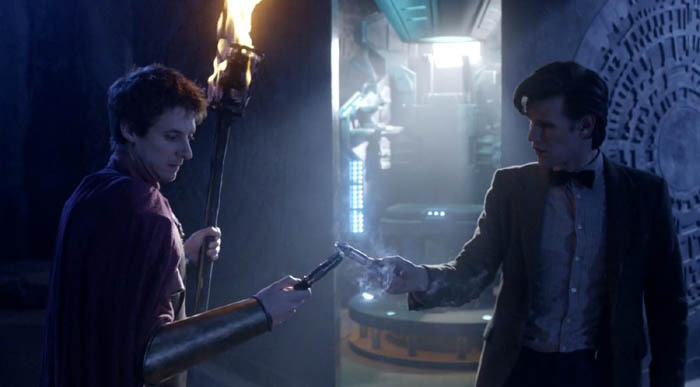 It’s a good twist, because you spend most of the first episode thinking there’s a monster inside the Pandorica, but in fact the monster is the Doctor and all the bad guys are there to save the Universe for a change. It must have taken an incredible amount of planning on their part, though. 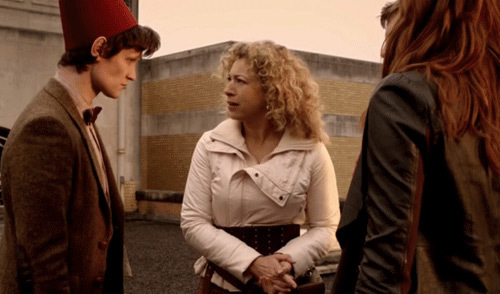 They had to read a psychic imprint of Amy’s mind to create the trap, ensure the coordinates were written on a painting that would get passed down to River Song, who would find a way to escape prison and bring the Doctor to the right place. Convoluted isn’t the word! You also have to wonder, if keeping the Doctor sealed away for eternity is so important, why make the Pandorica so easy to open again from the outside? Auton-duplicate Roman Rory, now with sonic screwdriver action. The Doctor tells the alien spaceships over Stonehenge to bugger off for a while. Okay kid, this is where it gets complicated. With the first episode ending on the most extreme of cliffhangers, the Tardis exploding, the Doctor trapped forever, and the lights in the Universe blinking out of existence, it takes a hell of a job to undo it, but this is one of those occasions where it mostly works satisfyingly, thanks to Steven Moffat’s knack for planning out long-winded and complex plots and believing in the audience enough to keep up with it. 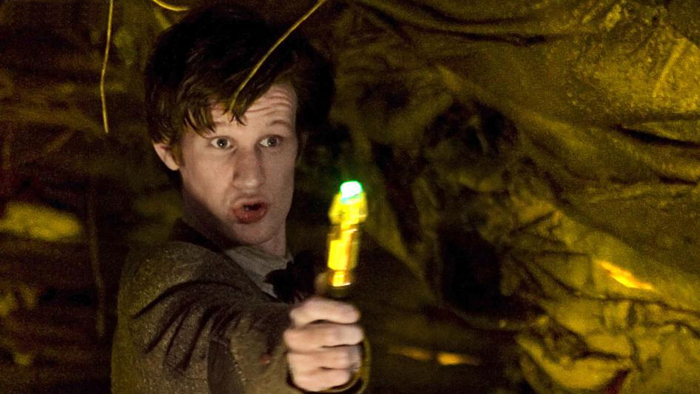 Through a series of time jumps, the Doctor sets into motion an elaborate plan to rescue himself and works out how to undo the erasure of the Universe. These sequences are both amusing and clever, not to mention logically consistent (a rarity in a show that supposedly deals with time travel), so it’s a shame that a large part of the climax revolves around, basically, magic. This annoys me, because the story could rely on its use of hard temporal mechanics to sort itself out, but instead descends into wishy-washy metaphor. Erased from existence, the Doctor is brought back into the Universe by the power of memories or love or some such nonsense. How does that make any sense? The mind is not some magical thing that can overcome the laws of physics – either somebody exists in spacetime or they don’t. So now we have a situation where the Tardis was actually blown up, but now it wasn’t because it was undone, except that it still did happen because they remember it and still need to work out who was responsible for it, even though it quite obviously didn’t happen because the Tardis still exists. The Doctor was at the heart of the Big Bang version 2, except he clearly wasn’t because he still exists, and he only exists because Amy and Rory remember him… and so on, and so forth. It’s not quite as bad as “the whole world prays for the Doctor” but it’s the same sort of thing. Well, whatever issues there are with the plot, I can’t deny that it’s bloody ambitious. I also love how the previous episodes from the season are incorporated into it, with Vincent’s painting passed down through history, and then later with the Doctor revisiting Amy in their previous adventures and finally explaining that weird scene from Flesh and Stone. 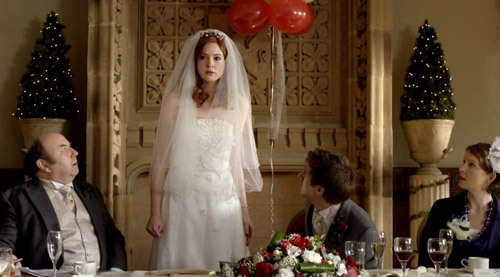 Amy’s story arc also reaches a conclusion, with the mystery of her vanishing parents solved, the crack in her room being sealed, and Rory coming back into existence in time for their wedding day. 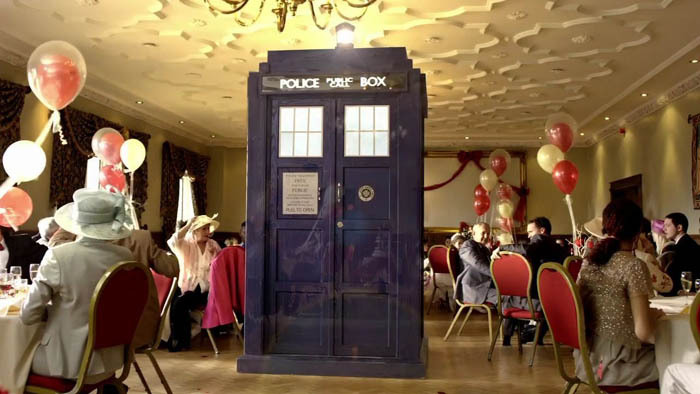 It’s hard not to feel a twinge of emotion as the Tardis materialises during the reception, to the words “something old, something new, something borrowed… something blue”. Yes, very clever, Steven. How long had you been waiting to write that? I suppose what I liked most about this finale is that all the overblown threat is contained with a minimum of bluster within part 1. After the big incident, the second part is relatively low-key. There’s this wonderful mix of the utterly bleak (all the stars have gone out, the Tardis is burning in the sky for two millennia, and the Earth will soon disappear), the heartwarmingly lovely (Auton-duplicate Rory standing guard over Amy for 2000 years) and the bloody funny (the stuff with the mop and the fez). There was never any doubt that everything would turn out fine in the end, but getting there is a fascinating journey. For that reason, it’s the best season finale of the new series, despite the problems I had with it. 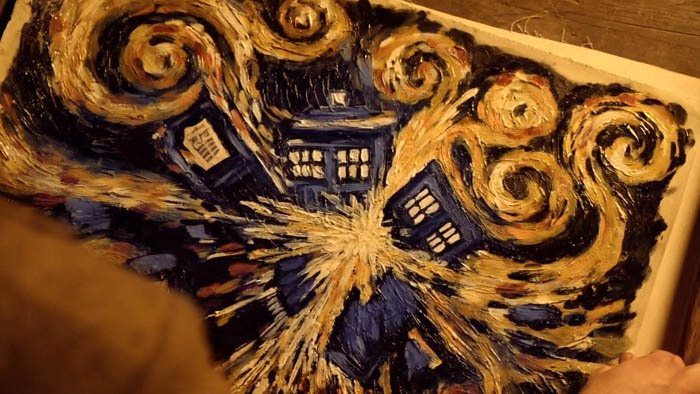 The exploding Tardis painting makes for a lovely piece of wall art. I was hoping to have revisited Matt Smith’s entire run before season 8 begins, but as I type this, Peter Capaldi’s debut is just days away, so I’m going to take this opportunity to take a ‘deep breath’, enjoy the new series and come back to this in a little while. I enjoy these “fish out of water” stories. There’s tons of potential for the Doctor to find himself lost among humans, struggling to fit in and understand their ways, but it’s not something that has been done very often, probably because the Doctor has never before been quite so… alien. I can’t imagine this story working with any previous Doctor like it does with Matt Smith (which is odd, because it’s based on a story written for the tenth Doctor). The fifth Doctor was good at cricket; the eleventh is good at football. Apparently. 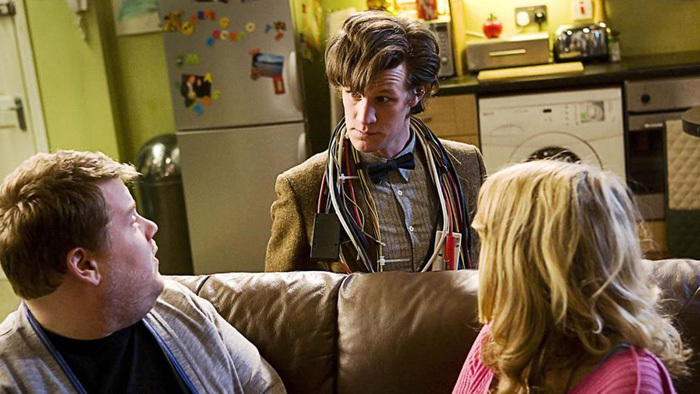 With Amy trapped on a malfunctioning Tardis, the Doctor has to team up with his new flatmate Craig, played by James Corden, in a spin on the classic Odd Couple scenario. The Doctor tries to fit in during his stay but gets things hilariously wrong, and Craig gets increasingly irritated by the Doctor muscling in on his life and causing friction with his potential love interest Sophie. The wider plot is really about a monster living in the upstairs flat, but it’s centred around a sweet love story full of frustration as Craig and Sophie repeatedly shy away from their feelings. Whatever opinions you might have about James Corden, he’s perfectly suited to this sort of awkward character. “Perception filters” play a big role, and the revelation of what’s really upstairs is an excellent twist with a nicely creepy tone. Unfortunately, there’s a lot left unexplained, such as whose ship it was and where it went. Maybe that’s not important, and the ship’s control room does get re-used for the Silence in a later episode, but it’s Steven Moffat’s “mysterious era” where plot threads go annoyingly unresolved for years at a time, so it grates a bit. It’s not every day the second floor of your flat turns into a spaceship and disappears. 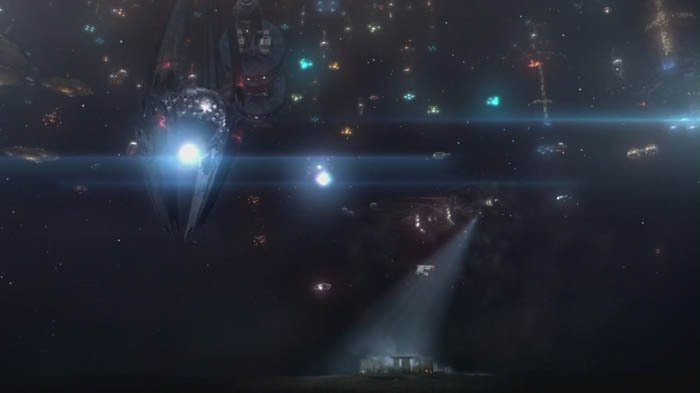 Despite the darker implication of an alien computer frazzling humans in an attempt to find a suitable pilot, the episode is otherwise lighthearted and comedic. Matt Smith is great as, basically, a total weirdo (sorry Matt) and the writing is funny throughout… however, it does border on the wacky for wackiness’s sake at times, with the Doctor’s crazy spinning machine thing and imparting information through psychic headbutts. That was too silly for me and not really needed, particularly when the story has something more meaningful to say about boring ordinary lives and not falling into a rut. It also shows the Doctor is more perceptive than he seems, as he correctly identifies the romantic desire between his new friends, suggesting his wacky routine is more of an act than a nature. On the face of it, Vincent and the Doctor could be described as just another Doctor Who story that visits a famous person from history, adds a monster and calls it a day; but this time it’s more of a personal story, more relevant to Vincent van Gogh’s life and experiences. The monster, it could be said, is a metaphor for the monsters in Vincent’s mind, the crippling bouts of depression that sent him into madness and despair. It would be all too easy to make light of this and handle it badly, but for the most part it works. 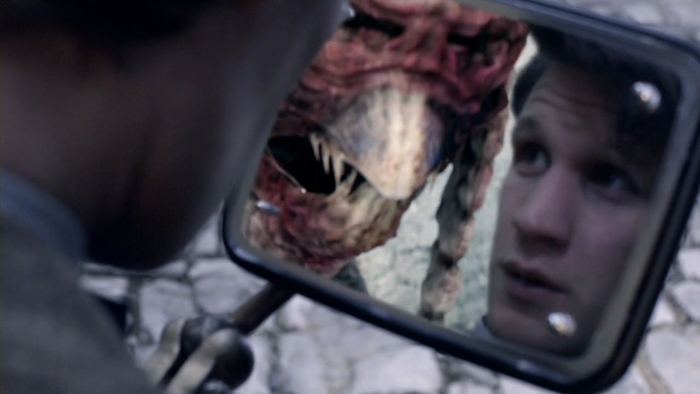 The Doctor uses a mirror-like device to detect the Krafayis. 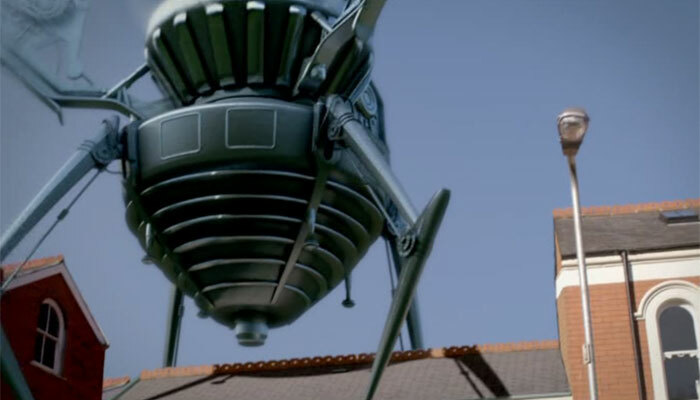 The monster, an invisible alien called a Krafayis, is not even that important to the plot, merely serving to get the Doctor’s attention and give Amy, Vincent and he something to do for half the episode. The emotional core of the story is in this world-famous artist being unappreciated in his own time and feeling worthless and irrelevant, and what could happen if he were brought into the future to see his own legacy. The ending certainly brought a lump to my throat, as Vincent’s life and work are praised by the museum curator. 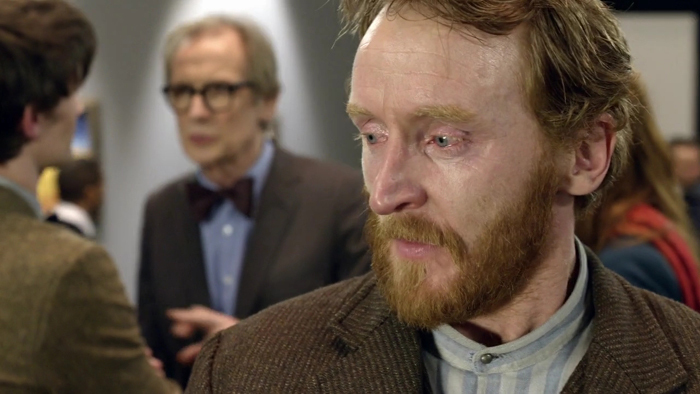 Naturally, this being an episode written by Richard Curtis, the curator is played by Bill Nighy. Classy. Turn on the waterworks as Dr. Black praises van Gogh, unwittingly in his presence. 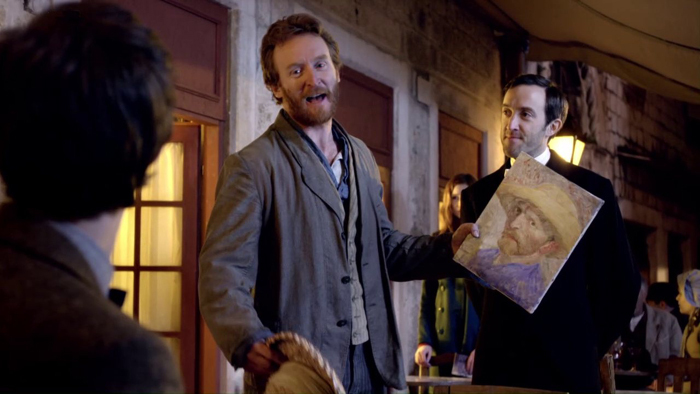 Tony Curran’s likeness to the famous artist is fortunately excellent, although his Scottish accent is hand-waved as (presumably) a quirk of the Tardis translator. The performance is also excellent, and although the scene depicting Vincent’s bout of anguish is short-lived, it’s also believable and maturely handled. 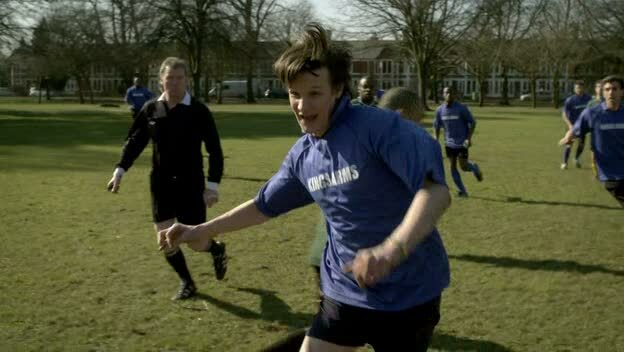 His falling for Amy is similarly quick due to the time constraints of the episode, but similarly believable as well. Vincent van Gogh attempts to sell one of his “worthless” paintings for the price of a drink. Granted, this is an impressionistic take on van Gogh’s life, painted with broad strokes for the sake of a story about an abandoned invisible alien, but it’s undoubtedly written with reverence for the artist and his work, even more so than The Shakespeare Code was for William Shakespeare, or The Unicorn and the Wasp for Agatha Christie, and without resorting to mockery. The sets have been built and decorated to look like his paintings and the episode is more colourful than the usual desaturated style, with vibrant blues and yellows aplenty. The painted sky sequence is a treat. Vincent considers the challenge of painting sunflowers. This is a heartwarming story with a bittersweet ending. Vincent’s fate couldn’t be averted, but what the Doctor says about adding to the amount of goodness in his life is very true. Life is a complex thing and there are some monsters that even the Doctor cannot defeat. When I first watched this two-parter in 2010, I was aware that the Silurians had previously featured in Doctor Who, but that was about it. 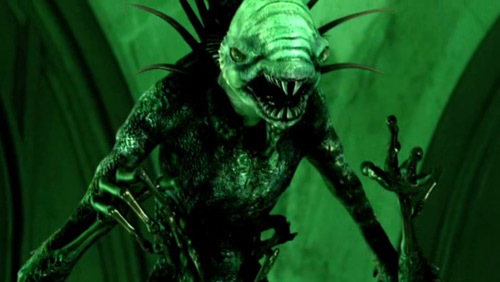 They are not your typical overused villains; in fact, this is only their third appearance, or their fourth if you count their aquatic cousins, the Sea Devils. Mind you, given the physiological differences, these Silurians are pretty much distant cousins too… unless we’re to believe that those old rubber suits were supposed to be masks also. The Doctor removes Alaya’s mask. 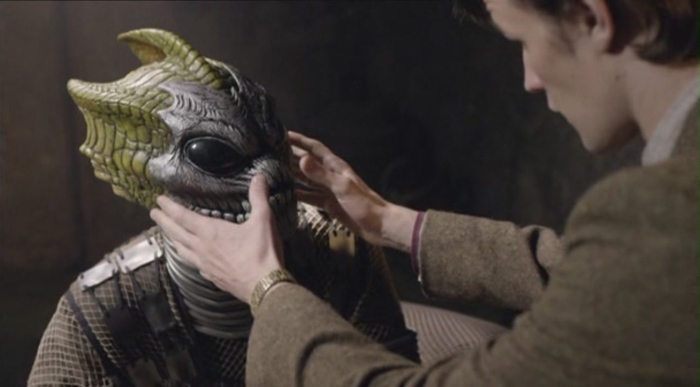 As the intent here is to sympathetically paint the Silurians as people rather than monsters, they have humanoid faces under those masks, but the de-monsterfying goes further than that. There is discord between the civilian government and the military, who are considered old-fashioned warmongers who need to change their ways. Cold Blood focuses on the attempt to build a peaceful relationship between the Silurians and the human race, amid tension surrounding the death of one of their soldiers, with the Doctor struggling to prove that humans aren’t a threat to them. It’s not dissimilar to his attempts at peaceful negotiation in the first Silurian story, which had a rather unfortunate end for the ‘monsters’. The resolution here is more optimistic, and perhaps another story will revisit the Earth in the year 3010. The humans and Silurians attempt to arrange peaceful coexistence. The Doctor has come a long way since then. His grumpy third persona was dragged into these facilities by UNIT, but Eleven is positively giddy with excitement upon laying eyes on the big drilling thing and wants to get himself involved right away. While Three thought badly of humanity and was proved right, Eleven loves humans and what they can be, but is let down. Additionally, you probably wouldn’t see the third Doctor making jokes in the face of danger or running around using a sonic screwdriver like it’s a gun, which unfortunately happens here, but frankly, I’ll take that over agonisingly drawn-out seven-part serials. Look, it lights up. Bang, bang!! That said, however, The Hungry Earth is a little drawn out itself, teasing the reveal of the creatures below the Earth. It’s the schlocky monster movie to Cold Blood’s political drama, and does less to set up the human characters than the second part manages under a tighter time limit. I didn’t really care about any of them in part 1, but by the end of part 2, I found them quite likable and believable. As an ensemble piece, it’s well-balanced and everyone has something to do. Rory is particularly good again. 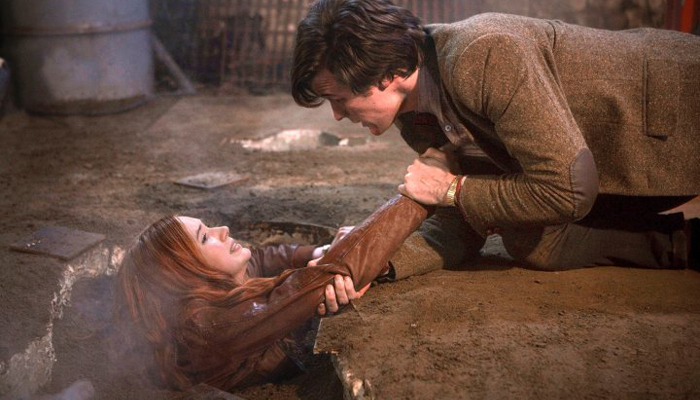 Amy is pulled into the ground by forces unseen. Unfortunately, poor Rory gets a raw deal. It’s not good enough that he gets killed shortly before the story is over, he has to be erased from history and forgotten too. The last few stories have shown that the two companion dynamic works brilliantly, so to see him written out like this is disappointing. He will come back later but, appropriately enough, I’ve forgotten how (sorry, Rory)! The sudden appearance of the crack and the piece of Tardis shrapnel is forcibly squeezed into the closing minutes, killing the pace with a pointless mystery. It’s not the subtlest of season arcs, this crack thing, is it? 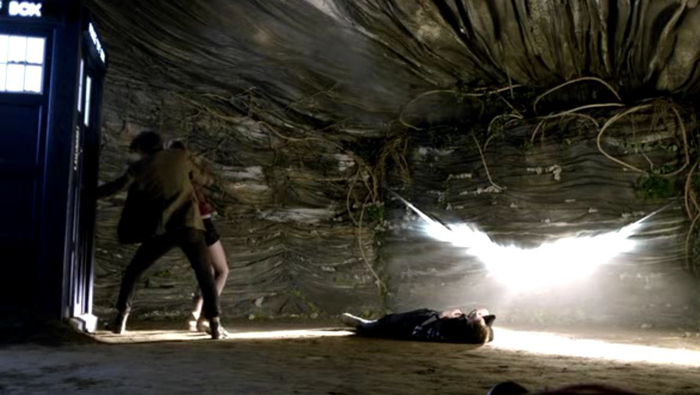 Riddle me this: Why couldn’t the Doctor throw Restac’s gun into the crack, thereby erasing it, and Rory’s death, from history? Five years have passed since Amy and Rory travelled with the Doctor, and now they’ve settled down in the sleepy village of Leadworth. 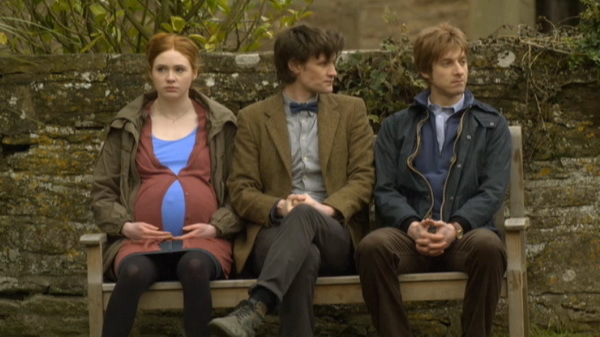 Amy is heavily pregnant, Rory has a ridiculous mullet, and life is good for them. But when the Doctor drops in on them again, they keep having dreams that they’re back there with him in the Tardis. Anyone else think Amy looks good pregnant? 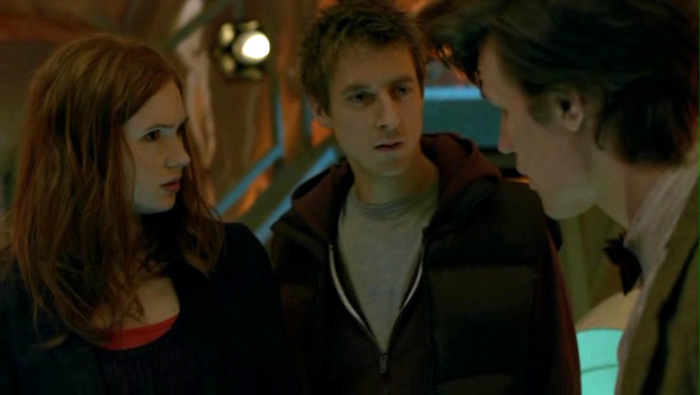 Amy and Rory have recently joined the Doctor and are travelling with him in the Tardis. But when the power fails and the temperature starts dropping, they all start having dreams that they’re five years in the future, settling down to start a family in the sleepy village of Leadworth. THIS one is reality, definitely. Or maybe the other one was. Naturally, they can’t both be true, and from the audience’s perspective, it seems obvious that the former is a dream. Perhaps if this was a later season (say, the seventh) and the supporting cast were being phased out, the village setting would be equally believable. We’d be as genuinely confused as the characters as to which is reality, but even the first time I watched it, it was obvious that five years weren’t going to pass between episodes in the middle of the first season with a brand new companion. Nevertheless, it’s entertaining to watch the mystery unravel. 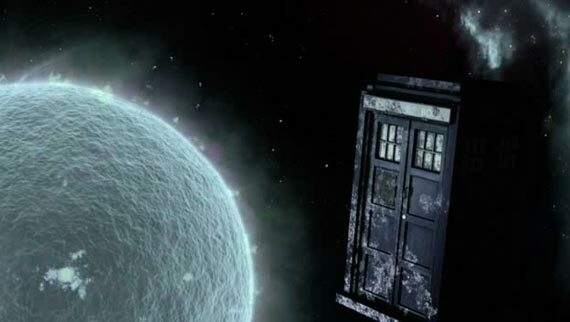 The Tardis falls into an impossible “cold star”. Or does it? Amy’s choice is between her fiancé Rory and the Doctor, but she doesn’t really end up making such a choice. Since Rory is killed in the village, she is forced to pick the only reality where he’s still alive, which is so easy a choice that it might as well not exist. The fact that the story then pulls a “it was ALL a dream” ending out of the bag could be seen as a massive waste of time anyway, but actually, I rather like it when an episode breaks out of the standard mould. It also reminded me a little of the very first “in the Tardis” type story, The Edge of Destruction. Weirdness all round. Toby Jones as the Dream Lord. Or is he? That the Dream Lord is not some malicious fiend makes a refreshing change. It would have been too easy to bring back one of the many entities encountered over the course of the Doctor’s adventures. It’s more sinister to realise that he’s part of the Doctor’s mind, the darker part of his subconscious. The Dream Lord’s apparent power to put them to sleep is frightening enough that you could do away with the alien-possessed elderly villagers plot, but I like how it almost turns into Hot Fuzz in the second half. Clearly, this was a budget-saving episode but, as I repeatedly like to point out, these are often the best. Invasion of the pension snatchers. It’s low-key, it’s creepy, it’s different. It puts the characters into an interesting dilemma and it accurately captures the convincing illusion of dreams. The actual choice may not have been the defining moment I would have liked, but the episode’s unique qualities make it a highlight of this season. 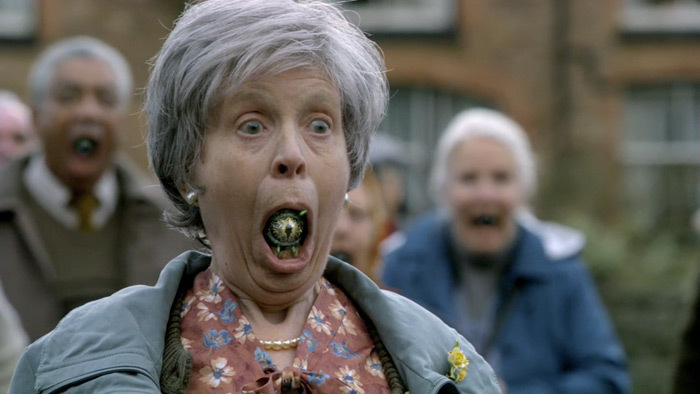 And I never expected to see Rory whack an old lady with a piece of wood, so that’s something. The Vampires of the Venice is one of those forgettable mid-season episodes that I often get confused with earlier episodes that are distinctly similar. 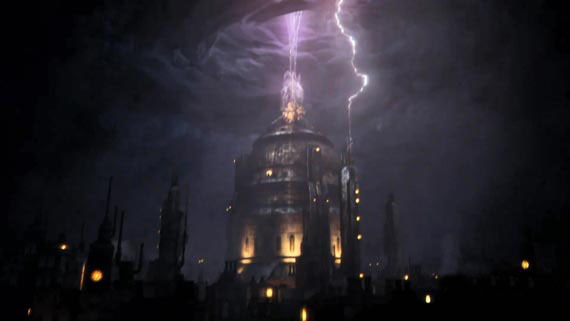 Historical setting, aliens disguised as humans (fishy vampires, in this case) and, goodness, it even ends with the Doctor climbing up a tower in a storm to disable some sort of equipment at the last possible moment, which he’s done at least twice since the revival. I don’t know whether to be aroused or terrified. It has a certain old-school feel, like the classic serials, in places. The Venice setting looks a bit small and stage-like (though that’s probably unintentional), and the Tardis Team works together as an ensemble, cooking up a plan together, with Amy getting herself captured on purpose and Rory getting into a swordfight (with a broomstick). But it’s fairly breezy and handles dark themes with humour. Rory is an excellent addition to the cast, as Amy already takes this dangerous life for granted. Plus, his delivery is just perfect. I’m glad he’s sticking around for a bit longer. Amy and Rory try to enjoy their romantic getaway to 1580 Venice, before the inevitable danger arises. Seriously, what are the odds? As Doctor Who likes to do, the mythical creatures are explained as being aliens, and all their quirks (lack of reflection, drinking blood) are explained away with “science”. There are no surprises or twists and I was honestly getting bored by the final act, as tidal waves threaten to sink Venice and the special effects struggle to keep up. There is a cryptic reference made to the the Silence at the end, but it’s meaningless at this point. With their perception filter switched off, the Saturnynians revert to their true form. 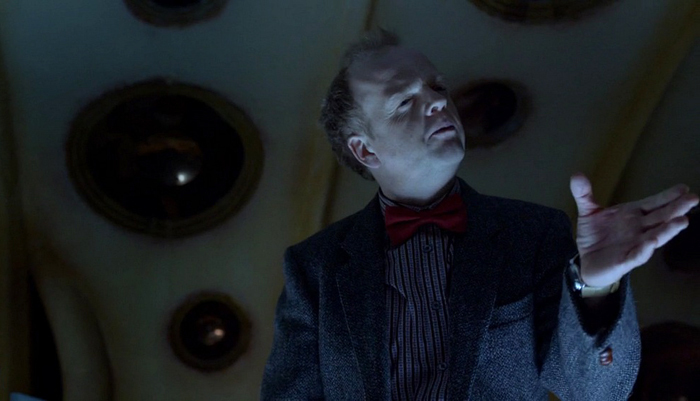 Perhaps the most interesting aspect of the episode is the brief injection of dramatic conflict as Rory confronts the Doctor about putting people in danger, or rather, making people want to impress him by putting themselves in danger. I like it when the Doctor’s motives and actions are examined by others, as it helps us to learn what drives him. There’s actually a much better exchange in Meanwhile in the Tardis Part 2 (set immediately prior to the events of this episode) where the Doctor explains why he needs fresh eyes with him to see the Universe with wonder again. There’s nothing quite that good in Vampires of Venice; it’s rather… ordinary. Not bad, certainly funny in parts, but run-of-the-mill.